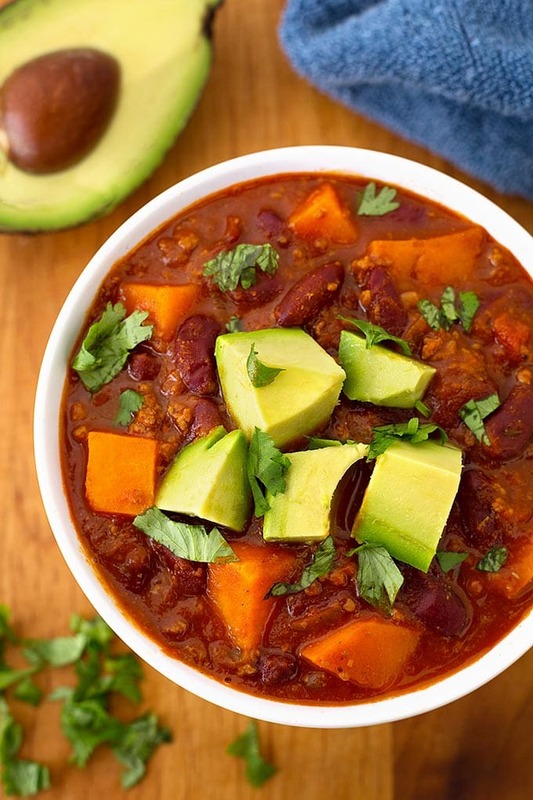 Instant Pot Mini Sweet Potato Chili is a perfectly proportioned batch of chili that fits in the 3 quart Instant Pot pressure cooker. 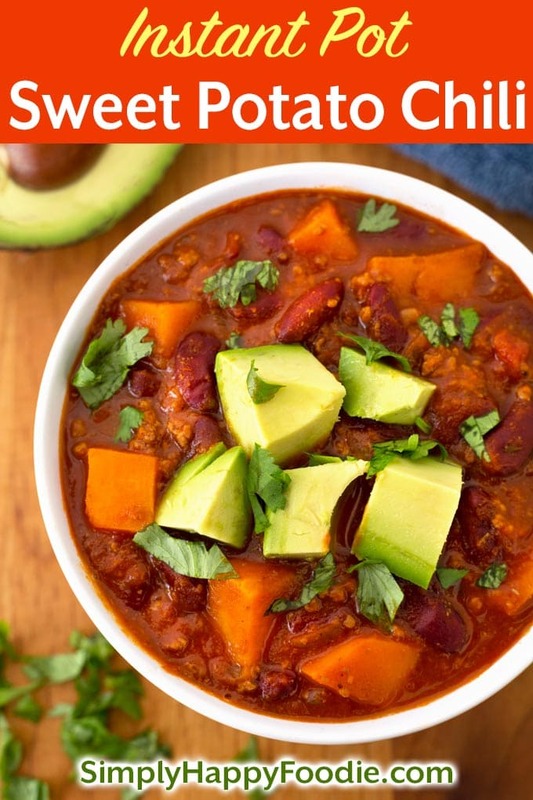 This Instant Pot pressure cooker Sweet Potato Chili recipe has a lot of flavor, and is a healthy meal. I used to think it would be strange to put sweet potatoes in chili. Then I tried some at a local restaurant, and loved it! 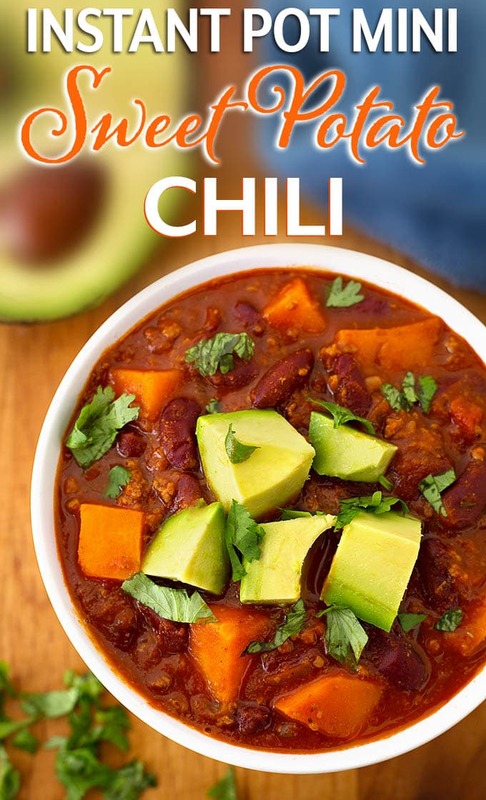 I decided to adapt my own chili recipe to have the addition of sweet potatoes, and have really enjoyed it! When I was deciding on the first recipe to make in my new 3 qt electric pressure cooker, I immediately thought of this Instant Pot Mini Sweet Potato Chili because it is easy to make, and you can use just one can each of the canned ingredients. So easy. It is healthy and very delicious! Make this vegetarian by leaving out the meat. Use double the beans if you wish! And it only makes 5 cups! Perfect for the single, the couple, the student, or anyone who just wants a smaller amount of chili! If you have a 6 quart Instant Pot, and want more servings, just double the recipe. 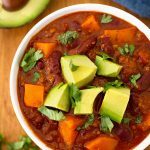 This Instant Pot Mini Sweet Potato Chili recipe is developed for the 3 quart size electric pressure cooker. It's nice to have a healthy, delicious recipe you can make in a smaller quantity. Double the recipe for a 6 qt cooker if you want more servings. Set the pot to the Sauté function (Normal/Med heat). When the display reads "Hot" add the ground beef (If using turkey, add 2 tsp olive oil first). Cook until the meat is mostly done. Add the onion, stir. Cook until the onion starts to turn translucent. Add the garlic, stir and cook for i minute, until it turns fragrant. Add the green chiles, chili powder, cumin, oregano, thyme, chipotle chili powder, smoked paprika, salt, and pepper. Stir well. Add the can of diced tomatoes with juice, stir. Add the tomato sauce, kidney beans, sweet potato, bay leaf, and water. Stir well. Let contents come to a simmer, stirring occasionally. Give one last stir, scraping the bottom of the pot, and close the lid. Lock it in place and set the steam release knob to Sealing. Cancel the Sauté function. Press the 'Pressure Cook' button (Manual) and the + or - button to select 5 minutes. Stay by the pot until it comes to pressure. Sometimes with chili it will start to count down the time, but won't come to pressure. If that happens, and the pin in the lid is DOWN, open the lid and stir well, scraping the bottom of the pot. Then put the lid back on, reset the steam release knob to Sealing, and Cancel and reset the time. Stay with it until it reaches pressure. When the cook cycle ends, let the pot just sit and naturally release the pressure for 5 minutes. Then turn the steam release knob to the Venting position to release any remaining steam. When the pin in the lid drops, Open and give it a stir. Remove bay leaf. Serve garnished, as chili is always better with great toppings! This chili tastes even better after it sits for a while! Double the recipe for a 6 qt pressure cooker if you want more servings. Made this tonight for dinner. Very tasty! Thanks for making 3qt recipes. I’ll have to try out the other ones! Hi Lauren! I’m glad you liked it! Thank you for your comment and review! Desperately need three quart instant pot vegetarian recipes! Hi Gerry! I am working on some great 3 quart vegetarian recipes for my book. Stay tuned! This chili is excellent!!! I don’t care for kidney beans so I substituted chopped red pepper. I love the sweet potato in it! Even tho I have a mini IP, I doubled the recipe and made it in my 6 qt IP, which came out fine. Thank you! Hi Maureen! That’s excellent! I just love sweet potatoes in unconventional ways. I have two other soups with sweet potato. If you search in the soups category you will see them. Thank you for the wonderful review! My instant pot does not have a manual button. Which button do I use for this particular function? Hi Rachel, the newer pots have a Pressure Cook button. That is the new Manual. I assume the sweet port are fresh Right? Yes, they are fresh. You could use fresh/frozen if you want to. This was amazing. I love it. The chili is my second time using my instant pot mini. Made the spaghetti before. LOVE both recipes. Hope you continue to include recipes for the mini. Thank you so much for taking out the guess work. Hi Sue! I’m really happy that you liked this chili! It is a favorite of mine, too! Thank you for your review. I’m working on more 3 qt recipes, so stay tuned! I have to admit I made a couple of edits before trying the recipe as presented, and I apologize for this. It was excellent. Here is what and why I made changes. 1-I love using stew meat or pork chunks in chili, so I changed it for stew meat. 2-I also love chickpeas in chili, so I added a can of those. 3-I love heat, so I added a chopped jalapeno. Trading stew meat meant I needed to pressure cook 15 mins before adding the sweet potatoes or they would be overcooked. I depressurized and added those and pressured for another 4 minutes. This was amazing chili and only took an hour with everything I did extra. The sweet potato was 2 cups, so I used it all. This made it exactly up to the 2/3 mark. It makes about 9 cups of chili, or 5-6 servings. Another thing I like to do is take a few of the broken tortilla chips and grind or crush them to a powder and add them at the end to thicken when I add the potatoes. I only use soup mode after adding the pulverized chips or they tend to stick to the bottom under pressure and could burn. Hi David, those sound like tasty changes you made, and still keeping this chili lose to te original. I’m glad you could make it your own! Thank you for your review! 1. do you know how muchBBQ baby back ribs you can cook in a 3 qt size? Have you ever tried it? 2. Your recipes sound wonderful and was wondering if I bought a 6 qt pot, can your recipe for 3qt IP be used using a 6 qt pot without having to double the ingredients? Any cons for buying the bigger size pot mostly for 1 to 2 people cooking and for reheating for 1 person? Hi Flora, You can’t fit very many ribs in the 3 qt. They are too tall, and you would need to cut them first. Not impossible, but not convenient, either. My hubby and I can eat almost a full rack for dinner, with just a few left over. So I much prefer the 6 qt for them. If you get a 6 qt, you can still make the 3 qt recipes in it. There should be plenty of liquid to support them in the 6 qt. I would get the 6 qt only because you can cook the ribs, roasts, and for company, if you ever need to. The 3 qt is nice for 1 or 2 servings, and if you are light eaters, it would work well for most recipes. You can cut most 6 qt recipes in half. If you have room, and a place to store it, I’d go with the 6 qt. Thank you Sandy. It sounds like the 6 qt is more versatile since you can still make 3 qt size meals in the 6 qt pot. I will get the 6 qt size. I’m looking forward to trying your rib recipe and the sweet potato chili for starters. That’s great, Flora! I hope you enjoy your new pressure cooker! Let me know if you need any help. I also have a beginners group on Facebook. Let me know if you want the info. you for the great receipt! I just bought a 3-quart Instant Pot and I’m trying to learn how to use it; I look forward to trying your recipes. (I had one of the old Rival 3 1/2 quart Crock Pots and used it quite often. After reading about the Instant Pots, I wanted to get one. However, the 3-quart IP seems much smaller than just one-half quart smaller than what I was used to using…) I will use it and hope for the best… Wish me luck and any tips you can share will be appreciated.